Silver skateboard tools available now at Tactics. 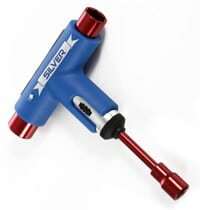 Packed with unique features and groundbreaking functionality, the Silver skate tool is one of the most versatile skate tools on the market and contains everything you need to maintain your board - an exclusive hardware ratchet, slide out screwdriver, grip tape file, and detachable allen key – all in one easy to use multi-functional tool. Don’t leave home without it.